Star Stories, part 3: "A Revolving Sky Above Nibaad Misaabe"
Boozhoo! Biindigen miinawaa nindaadizookewigamigong (Hello! Welcome back in my Storytelling Lodge)! I am Zhaawano Giizhik. 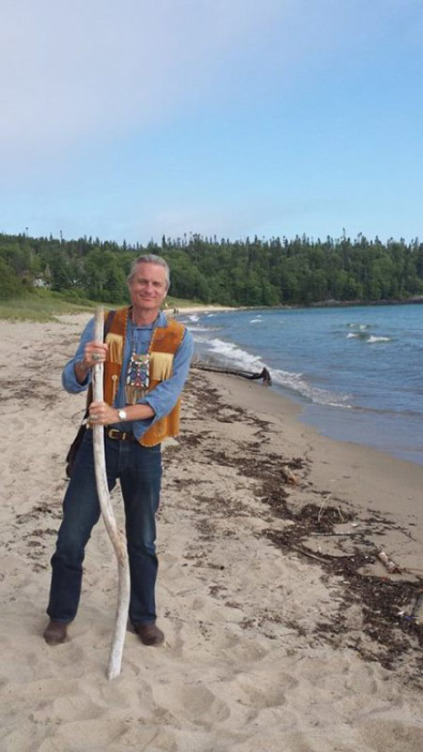 By way of a blog series called "STAR STORIES", accompanied by my jewelry designs and works of art by kindred artists, I pay hommage to the Star People and to the ancient star knowledge of my Anishinaabe ancestors. Today's story is the third in the series. 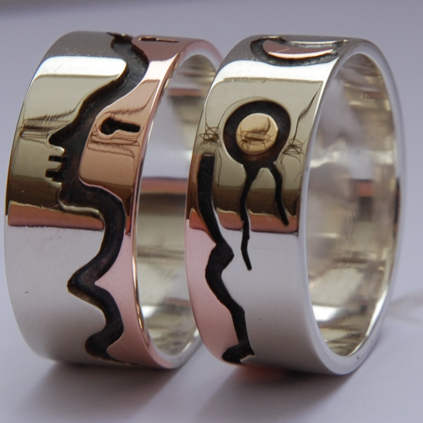 Before we take a look at the design of the below wedding bands and the aadizookaan (traditional story of a sacred nature) that they tell, let's first dwell briefly on the literal meaning of the Ojibwe Anishinaabe word for "tell a traditional story/storytelling," aadizooke/aadizookewin. The literal meaning of the verb aadizooke is ""make life-way of something." It therefore follows that aadizookewin, telling traditional stories, or legends, is more than about just telling legends; it is about the life-way, a conduct of living. The aadizookan that I share with you today is embodied by this unique set of muliticolor gold wedding rings, which were constructed with the aid of the technique of overlay. 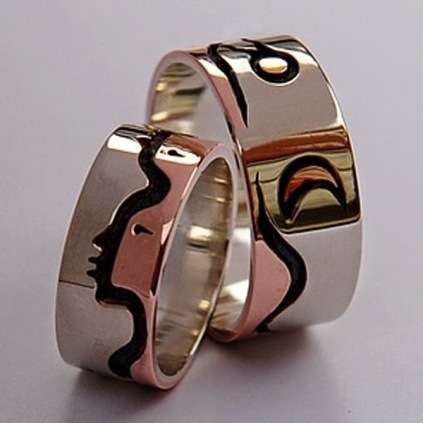 The design of the rings, which belong to the Mother Earth series, is reminiscent of the pictographic outline drawing style of the Medicine painters who paint in the Native Woodland School Of Art discipline. 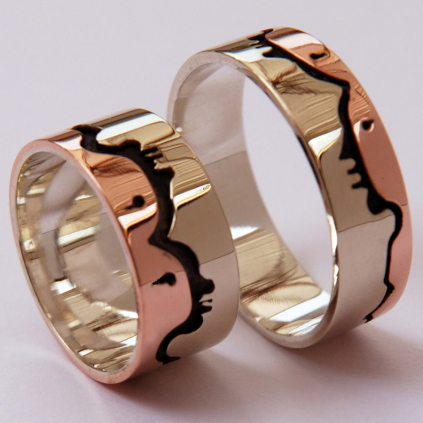 The dramatic outline of Nibaad Misaabe, the Sleeping Giant, an awe-inspiring rock formation that juts out on Lake Superior and forms the body of water that is Thunder Bay, is an important source of design inspiration for many of my wedding ring creations. If you like to know more about the story behind the mysterious aadizookaan (maker of stories) called Nibaad Misaabe, please see the second episode in the Reawakening of the Medicine People series. 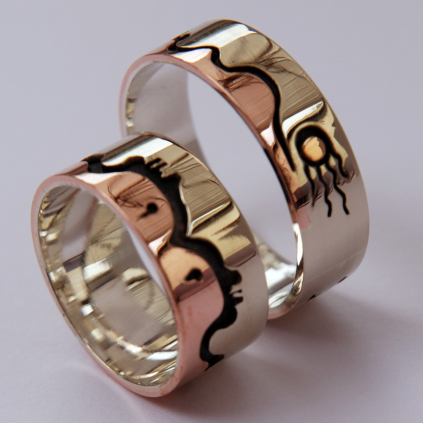 The red gold part and the oxydized (blackened) outlines of the design of the rings - which were modeled after the Nibaad Misaabe - represent the bodies and spirits of two lovers becoming one with each other and with the Earthmother herself. From her fertile womb they sprang, and unto Mother Earth they shall return. 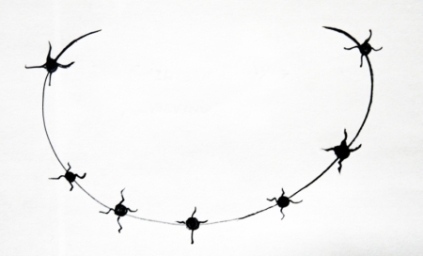 The inlaid design elements and the circular shape of the wedding rings refer to the Anishinaabe concept of GIZHIBAA GIIZHIG, or revolving sky, which pertains to the circular movement of the planets (see the inserted pen-and-ink illustration below). To the Anishinaabe, all knowledge and all life forms were inawendiwag, interconnected and interrelated. The term gizhibaa giizhig refers to the circular movement of the sky throughout the year, which has thirteen moons (months). 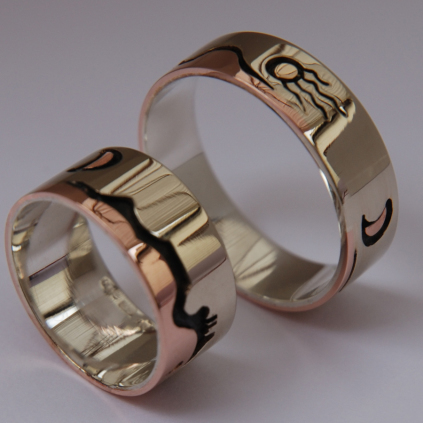 In other words, the notion of "'Gizhibaa" that I incorporated in the wedding ring design refers to the circular movement of the sun, moon, stars and seasons in Waawiyekamig, the "round lodge" - the Universe/cosmos. Thank you, that's it for today. * Onjida Charles Lippert for sharing with me your great knowledge of Anishinaabemowin etymology.